If you have ever longed to explore nature with your favorite architect or discuss the built environment in your bikini, now you'll have the chance. Well, for a few bucks, but in the good name of architecture. The Van Alen Institute has launched its online auction of Art + Design Experiences to coincide with its Spring Party, going down this Wednesday in Lower Manhattan. The auction list boasts exclusive and out-of-the-box experiences with top critics, famed architects, and professionals in the arts and design fields. 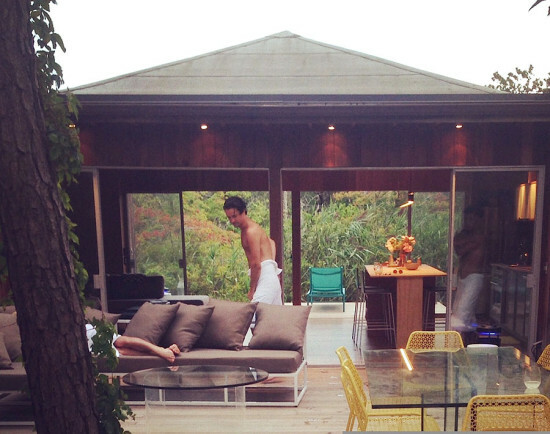 Some of the more compelling items, or activities, to bid on, include: —A Fire Island hot tub roundtable with architect Charles Renfro at his mid-century modern beach house. —Testing the smoke ring generator at Copenhagen’s new waste-to-energy power plant with Bjarke Ingels. —A helicopter ride on Norman Foster's personal helicopter through London’s skyline, including the architect’s own icons. 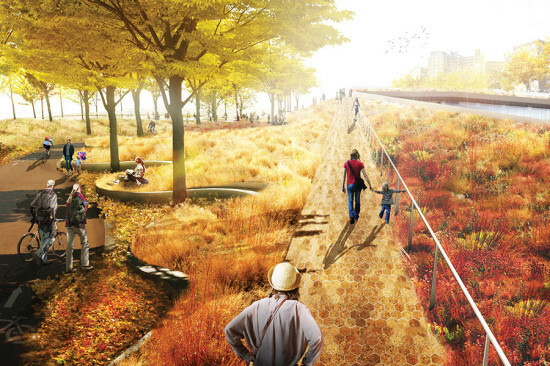 —A bird watching expedition in an iconic urban park with Jeanne Gang. —Joining Sotheby’s chairman Lisa Dennison for her daily salon blowout ritual as she offers tips on building a blue-chip art collection, followed by a personalized tour of MoMA's permanent holdings. Visit the auction site to check out and bid on the offerings. Bidding closes on Wednesday, May 20. Get your digital paddles ready. Richard Rogers' long-stalled 3 World Trade Center finally climbing again, it's concrete core rising steadily above its nearly-complete podium. 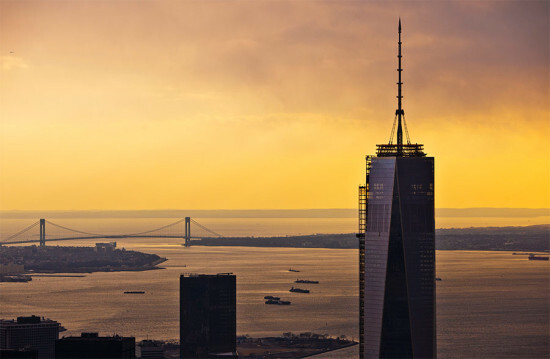 Now, it's Norman Foster's turn to bring the last of the World Trade towers to life, and it might happen this time with the help of a media giant. 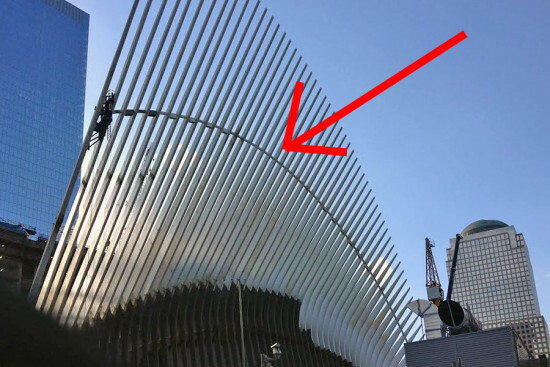 It's starting to look like Foster + Partners' 2 World Trade Center might actually get built, and it's all thanks to Rupert Murdoch. The New York Times reported that News Corporation and 21st Century Fox—both owned by the billionaire media mogul—are interested in using half the building (1.5 million square feet) as a joint headquarters. 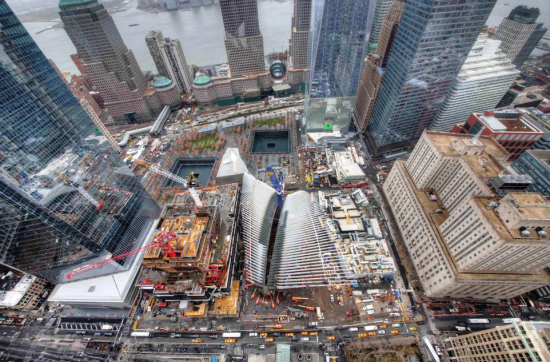 While there are no firm plans to speak of, the companies have reportedly been in talks for months with the Port Authority of New York and New Jersey and developer Larry Silverstein, who has rights to build at the site. 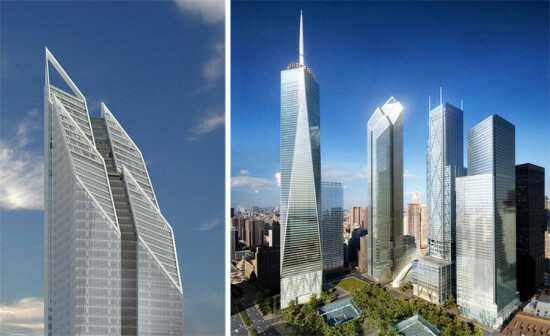 If the tower is built, it would effectively complete the drawn-out rebuilding of the World Trade Center. 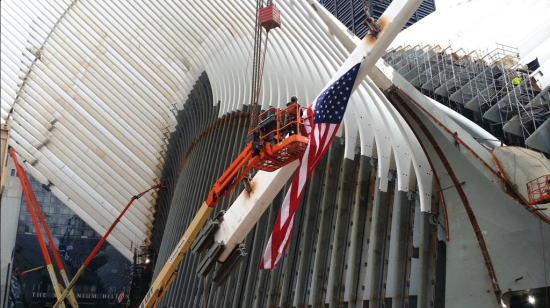 Two World Trade Center was originally scheduled to open in 2011, but, as is the case with just about everything with the World Trade Center redevelopment, that deadline didn't stick. The building, as designed by Foster, is widely considered to be the most architecturally adventurous of the glassy World Trade Center bunch. The 79-story structure appears as four rectangular forms, diagonally sliced at the top to form a set of four diamonds. “The building occupies a pivotal position at north-east corner of Memorial Park, and its profile reflects this role as a symbolic marker,” Foster + Partners said in a 2006 statement. “Arranged around a central cruciform core, the shaft is articulated as four interconnected blocks with flexible, column-free office floors that rise to level sixty-four, whereupon the building is cut at angle to address the Memorial below.” The building’s design was drawn up between 2006–2007 and is expected to change at least slightly if this deal moves forward—which the Times noted is far from certain. 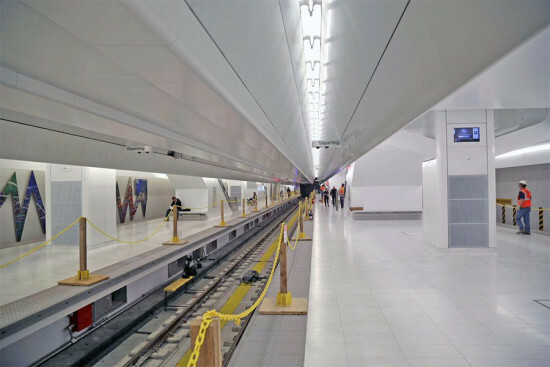 But if it does go through, the companies might select their own architect for changes. “Given that the foundation has been built, the two sides are assessing whether the structure can accommodate the changes they want for television studios,” reported the Times. 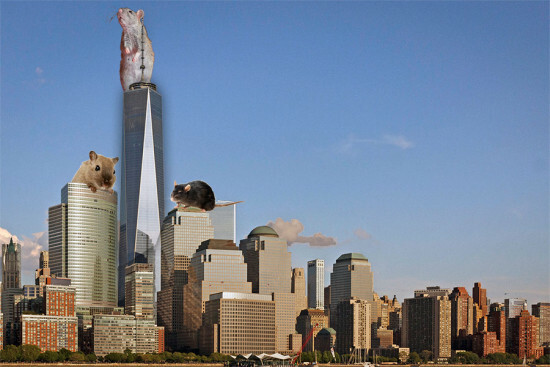 Speaking of One World Trade, Condé Nast’s highly publicized move-in did not go entirely as planned. According to Gawker, Vogue, which is occupying floors 25 and 26, had to delay the relocation of its editorial department due to an infestation of rats. The rodent problem was evidently so dire that the fashion magazine’s editor-in-chief, a one Anna Wintour, went so far as to issue an order to her staff that they must ensure her office is a rat-free zone before she sets foot inside. There was no indication of what measure might be taken should one of those little cheese-loving rascals appear among her papers when she does arrive. One only hopes that Ms. Wintour is an understanding boss who would offer her team some slack, especially where pest control is concerned, considering that it is not in the normal scope of an editorial job. Gawker also reported that Vogue’s sales and marketing staff did make the move on schedule. Eavesdrop is not sure what this might say about these types of jobs and their relative rat-comfort levels. Last night, at 6:00p.m. 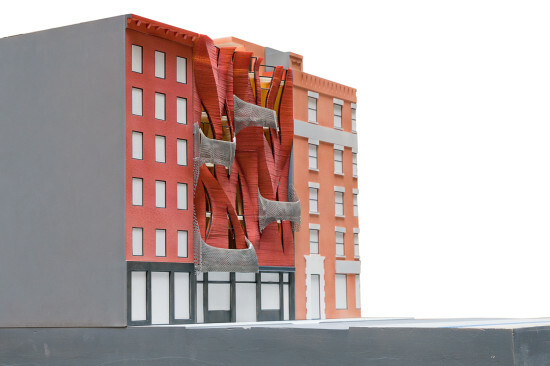 sharp, Community Board 1’s Landmarks Committee kicked off a public hearing on the Howard Hughes Corporation’s controversial plans to remake New York City's South Street Seaport. The event was held at St. Paul’s Chapel in Lower Manhattan and it was standing room only before anybody got up to the mic. By five after, people waiting on the chapel steps were being turned away. At first glance, the huge crowd makes sense. Since Howard Hughes first unveiled its plan to build a luxury tower next to the Seaport last year, local residents have been showing up in large numbers to meetings like this to voice their opposition. 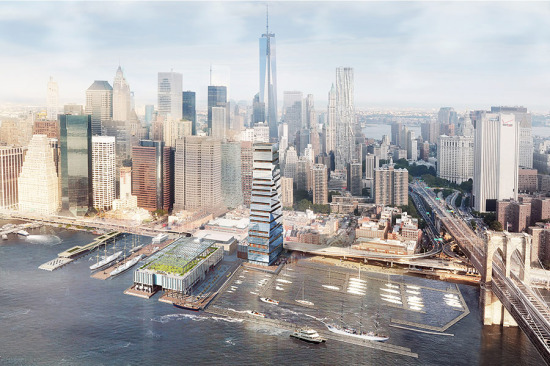 This event also comes shortly after Howard Hughes unveiled its revised Seaport plan: a shorter, SHoP-designed tower and more perks for the community. To many local residents and elected officials, though, that wasn’t enough. Tensions are still high and the developer is still pushing forward, so the turnout isn’t a big surprise. But there was something noticeably different about last night’s crowd, and it didn’t take long to figure out what it was. More than half the people packed into St. Paul’s pews were wearing the same blue or yellow t-shirt that said “SEE / CHANGE” and “Howard Hughes is committed to saving the Seaport Museum.” Some of this t-shirt-wearing contingent said they worked for Howard Hughes and were there to show their support. Others said they were residents or small business owners and wanted the plan to move forward. But that wasn’t everybody. Someone simply said his boss told him to show up. He declined to identify his boss or what line of work he was in, but admitted he didn’t live in the neighborhood. The same thing goes for another non-Seaport resident who said his boss—who has work relating to the Seaport—asked him to show up as a favor. Two men standing in the chapel’s balcony said they signed a petition and kind of just made their way into the event, one of the two worked Downtown. A young guy, maybe in his early 20s, said he was being paid to get people to sign those pro-Seaport petitions; yesterday, he said, was his first day on the job. Some people wouldn't answer the “why are you here?” question at all; others said they didn't really care if the tower got built or not. As for the event itself, SHoP walked through its updated plans, and things played out on familiar lines. Those who support the plan still support it, and those who don’t, don’t. The crowd was obviously heavily tilted toward the former. When SHoP partner Gregg Pasquarelli mentioned his firm's attention to historic detail, the crowd erupted in applause. It wasn’t until about 6:45 that people waiting outside were allowed into the event. An hour or so later, the crowd was thinning out and the blue and yellow shirts could be heard making plans to meet up at the event’s “after party" that included free ice skating, drinks, and food. That party was held at a South Street Seaport bar and actually started before the hearing even ended. When AN walked by, bartenders—decked out in yellow t-shirts—could be seen passing beers to their patrons who were wearing the very same thing. The crowd was small at that point, but the party hadn’t officially started yet—there was still half an hour of public hearing left. “A broad array of supporters including local residents, small business owners, and members of the labor and business community turned out in force last night to speak out in favor of the proposed plan for the Seaport," said a spokesperson for the Howard Hughes Corporation in an email. 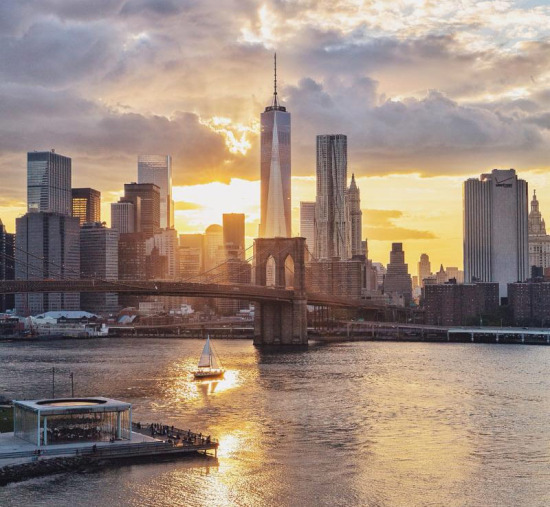 "In fact, a recent poll shows that over 84 percent of Lower Manhattan residents support the redevelopment plan for the Seaport District. To thank supporters for taking time out of their evening, The Howard Hughes Corporation held a skate party at the Seaport Ice Rink.” That poll was commissioned by Howard Hughes.